$2 million legitimate prize pools awaiting new winners every week. For more promotions check our Ignition Poker promotion page. Ignition Poker is the leading online poker platform following its recent purchase of Bovada assets, the software and player base. It will, therefore, provide a home for all the poker fans from the former Bovada online poker which is leaving the US poker market. Gamers had to switch to the all-new Ignition online poker. If you had been a gamer at the Bovada poker site, then you have an idea of how the Ignition software feels. The software is very stable and polished better than ever. Gamers will have a great playing arena on the site. It comes with a plethora of customization features like table felt and card backings in the different poker tables. The cards are visible, though the graphics may be a little off due to the old nature having been inherited from Bovada. However, the software is user-friendly, fast and very smooth. Besides, it is available for free download for PCs and mobile phones. Once you download the app on your computer, you will be able to access up to three multi-play tables. The three tables are displayed on the screen simultaneously during play time. The current table is usually larger than the others; however, you can swap between tables at will. One major feature is the built-in statistics window displaying all the information about the currently active table. Despite being new in the market, Ignition Poker is already providing generous incentives to the gamers regarding bonuses and promotions. The ignition poker bonus codes are the fastest clearing when compared to the other sites. When you register to Poker Ignition room, you will be awarded a welcome bonus equivalent to 100% bonus for up to $100 deposited. The bonus requires poker points which are reeled out in four portions as you advance to the target of four hundred points. Another bonus to look out for is a part of the matched bonus which can go up to $1000; however, that is in the Ignition casino games. There is also a loyalty scheme that relies on the points system. The points are vital for a gamer since they can be traded for tournament entries. For every 200 points, you are awarded a dollar playable in the various poker games offered. There are also promotions such as the bad beat, royal flush and mad Monday listed on the site. There are periodical offers too which come in the website that you need to look out for to improve your poker experience at Ignition. In the past few years, Ignition brand has expanded their tournament room to 3rd rank poker room globally. In the US it ranks second as per poker offerings. The games are adrenaline packed for the brave ones. 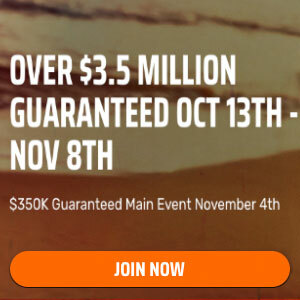 There is a $2M weekly guaranteed prize pools which are split into daily poker tournaments. The buy-ins, starting chips and prizes may vary, but the starter chip stack is constant at either 5000 0r 10000. The buy-ins cost ranges from $11 to 109. There is also the 100k sure poker tournaments which take place every Sundays at 4 pm ET. The initial place pay-out is worth $20k. You can either buy in directly going for $162 or opt for winning their way via cheap qualifiers. Mad Monday which commences at 1.18 pm is another tournament in which you have to engage. For every 18 minutes past the hour, competition begins until 11.18p.m. Ignition has myriads of Sit n go tournaments, with $1.10 to $215 worth of buy-ins, that come in different formats. Ignition poker bonus includes bitcoin bonus which gives gamers 25% match bonus for up to $1000 on every bitcoin deposit. There is also the invite a friend bonus where you will be rewarded 200% of your buddies’ initial deposit for up to every $100. Another special offer is the 2017 freeroll series in the poker tournaments which has a lot in store for the gamers. Ignition Poker allows players exclusively from the US, even for those who can’t play in New Jersey, Delaware or Nevada which have the only legal state-run poker sites. Therefore, join the Poker Ignition room today and play for wherever within the US region. This poker brand is certified and licensed by the Kahnawake Gambling Commission in Canada. That shows how gamers are safe since all the games offered as well as any cash involvements within site are legitimate and monitored. The withdrawals and deposits are safe as they support the Bitcoin currency. The supported payment methods besides bitcoin include American Express, Visa and Master Card credit cards, Discover, Rapid Transfer plus other e-wallet options. The customer support is active 24 hours a day. Contact options through which you can reach their support desk are the live chat, phone, and email. Ignition offers quick responses to all the queries that may involve withdrawal and gameplay among others. In addition get $50 Free! PokerStop.com© 2005-2019. All Rights Reserved.